Since his first recordings with Buffalo Springfield in 1967, Neil Young has been described as brilliant, cantankerous, confounding, ruthless, mercurial, and vexing. Regardless, his profound musical influence and his status as a critical favorite cannot be denied. Now the first illustrated biography to span Young’s 40-plus years as a recording and touring musician (and nearly as many forays into divergent musical genres, some wags might say), is updated through 2012. From Young’s earliest days in the Canadian folk and rock scenes through his tenures with Buffalo Springfield and CSN&Y and on to his varied solo career backed by bands including the Stray Gators, the Ducks, the Bluenotes, Booker T. & the MGs, Pearl Jam, and, of course, Crazy Horse, every aspect of Young’s long and varied career is covered. The book features the work of rock photographers from the 1960s to the present, as well as concert posters and ephemera from around the world, including picture sleeves, LPs, ticket stubs, pins, T-shirts, backstage passes, and more. Notable musicians from around the world chip in with commentary, and the book is further complemented with a discography and sidebars examining topics like Young’s involvement with Lionel toy trains (of which he is a part owner), Farm Aid, and San Francisco’s Bridge School. Daniel Durchholz is co-editor of MusicHound Rock: The Essential Album Guide and co-author of Neil Young: Long May You Run. He has written for Rolling Stone, Billboard, the St. Louis Post-Dispatch, Chicago Tribune, and Washington Post. He lives in Wildwood, Missouri. Gary Graff is an award-winning music journalist and a regular contributor to the New York Times Features Syndicate, Billboard, Revolver, and other publications, as well as radio stations in Detroit and Milwaukee. 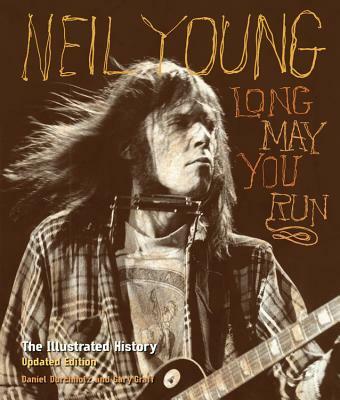 He is the co-author of Neil Young: Long May You Run. playitallnightlong.blogspot.comtwitter.com/GraffonMusicGary Graff is an award-winning music journalist based in Detroit. He is a regular contributor to the New York Times Features Syndicate, Billboard, UPI, the Cleveland Plain Dealer, Revolver, and other publications, as well as to radio stations in Detroit and Milwaukee. He is the editor of The Ties That Bind: Bruce Springsteen A to E to Z and the series editor of the MusicHound Essential Album Guides. He lives in Beverly Hills, Michigan.